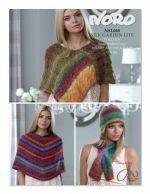 finished size 32" - 48"
Free with any purchase of Silk Garden Lite or Silk Garden Lite Solo, while supplies last. 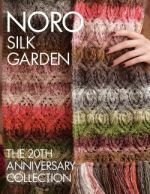 30 designs in Noro Silk Garden yarns, including cardigans, blanket, pillows, socks, hats, fingerless gloves, mittens, scarves, cowls, shawls, wrap, cape, and bags. 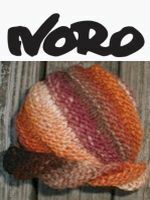 15 garments & accessories in new fall 2013 Noro yarns Shiro, Obi and Cyochin. 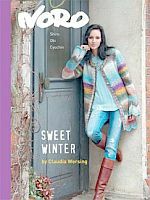 Includes sweaters, hats, scarfs, mitts, cowl, cape, wristlets and bag. to fit size 30" - 40"
finished size 28" - 38.5"